SelectHub is real people helping you find the best Manufacturing software for your unique business needs while recognizing the true manufacturing ERP systems leaders who help make your decisions possible. In the past several decades, we’ve seen a major shift in global manufacturing. The US was surpassed by China as the world’s leading manufacturing nation, with several other less developed countries investing in manufacturing as well. With more competition than ever, manufacturers will have to adopt new strategies and tools to cut costs while still providing excellent products. And in this industry, there’s no tool more essential than manufacturing software. ERP software for manufacturing industry use provides a number of capabilities, including reporting, built-in workflows, customizable interfaces and more. When implementing manufacturing management software, businesses can expect to achieve several major goals. The best ERP software for manufacturing will provide the key features needed for production, in addition to extra features to support other parts of your business. When evaluating ERP solutions for manufacturing, make sure to ask prospective vendors a series of questions like the ones we’ve listed below to understand how the product will benefit your business. The ability to track how production decisions impact the overall financial performance of a company is critical to profit and growth. That’s why manufacturing companies need to look at how each of the top manufacturing software vendors provides financial reporting and analysis from the production floor to the top floor. This involves taking the massive amount of data generated daily on the production floor and interpreting it using metrics defined by your team. The ability to track how individual orders are progressing through production is an integral part of a manufacturing software system. The integration of an MES and your master production schedules is what allows users to understand the impact orders have on how you plan your resources. For instance, ERP software for manufacturing can provide insight into how the number of orders and their complexity can affect your resources.Before manufacturing ERP software, the two systems were not very well integrated. The result was production systems that often didn’t have the latest build plans or work instructions, or the latest production scheduling information down to the cell level in time to staff them properly. Today, the best-in-class manufacturing ERP systems integrate these two aspects, pulling data from a common database. Role-based workflows are the new normal in the best manufacturing ERP software systems, with many providing templates and guides for getting started. This is especially useful for manufacturers that are transitioning from legacy ERP systems to the latest generation of manufacturing ERP solutions. The ability to define and implement entirely new products, assure quality throughout the process and configure alerts is all possible with role-based workflow design. In advanced manufacturing ERP software, there is often support for business process management (BPM), advanced mobile devices support, and company-wide social collaboration and communication. Enterprise manufacturing software must be intuitive for daily use on the production floor, yet agile enough to summarize metrics and KPIs to the senior management level. For production floor operators, there’s the need to have work instructions clearly and graphically communicated so each step in their process is understood. For senior management, the need for scalable dashboards that can support analytics now and in the future is also essential. As ERP vendors across all industries strive to improve the user experience, top manufacturing ERP system providers have an added challenge. 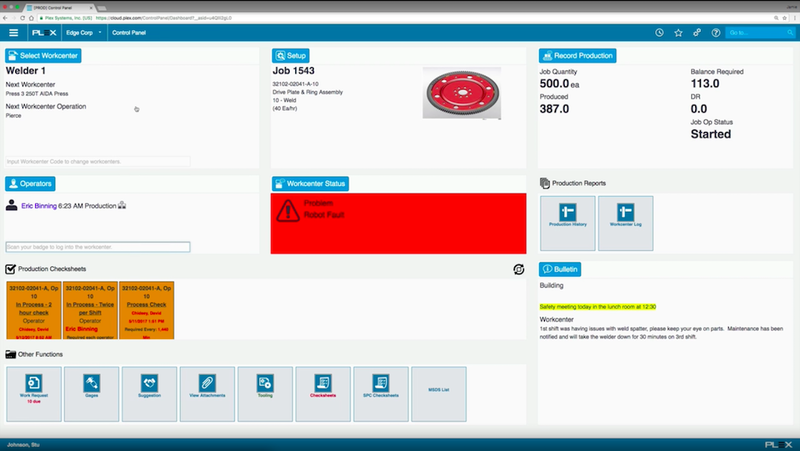 With such unique information needed by each user, manufacturing ERP vendors have to make sure all this data is easily available. But with the continued adoption of cloud platforms, this is becoming increasingly common to find in top ERP systems for manufacturing as browser-based app designs allow for faster customization. Cloud-based ERP systems are the fastest growing segment of the global manufacturing ERP software market today. IDC predicts the worldwide market for manufacturing enterprise resource planning software is valued at $7.3 billion in 2016, growing to $7.9 billion in 2018, attaining a compound annual growth rate of 2.5 percent. Cloud-based ERP systems are the fastest growing segment, projected to reach a 5.5 percent growth rate per year through 2018 according to International Data Corporation. Implementing cloud-based manufacturing ERP software is relatively simple and straightforward. They are also more easily configured to the unique needs of production teams and are better at aligning to complex workflows compared to their legacy counterparts. Integrating cloud-based ERP systems with third-party legacy systems are where implementation options including application programmer interfaces (API) become a priority. Often, cloud-based ERP providers will rely on third-party services firms to provide integration support. It’s a good idea to find out the extent of integration expertise at the operating system, server, database integration and support for legacy ERP systems as well. Gain Accounting Visibility From the Shop Floor to the Top Floor One of the biggest benefits of a manufacturing ERP is the visibility it provides into how shop-floor operations impact financial results. Since an ERP integrates all the systems managing your different operations, it can produce reports demonstrating the relationships between them. The best ERP system for manufacturing should be able to tell you the financial impact across all production operations, from supplier relationships to transportation. Improved Capacity Planning and Scheduling Advanced manufacturers use ERP workflows for assistance during capacity planning and scheduling based on forecasts and orders. With planning and scheduling tools, users can more easily balance customer demand with stock to meet more on-time shipments. Also, the latest generation of ERP systems has analytics and business intelligence capability that makes it possible to track and predict capacity planning and scheduling improvements over time. Greater Pricing Accuracy and Profitability By integrating cost-based and accrual-based accounting workflows into a manufacturing ERP system, it’s possible to see exactly how pricing decisions impact long-term profits. Often, manufacturers have limited, if any, visibility into how pricing is impacting their ability to produce. Yet, with an integrated manufacturing solution, visibility improves thanks to the single system of record. Improve Supplier Quality and Delivery Performance Quality is often only thought of in the context of the production floor. But what’s really needed in all manufacturing companies is an enterprise-wide view of quality. This way, each department can see how its decisions impact overall quality and compliance performance. After gaining insights into quality and compliance, users can then take advantage of manufacturing systems to proliferate this information to all departments, making quality a shared goal across the company. In order to achieve these goals, however, you can’t simply go ahead and implement the first system you find. You’ll need to choose a system with the basic manufacturing features as well as the advanced tools you need. In order to decide which features are necessary, come up with a list of manufacturing software requirements. The rest of this article will address what you need to consider as you create this list. The following features all play a central role in software for manufacturing companies. While some vendors will offer more advanced versions of these features, you’ll want a basic level of this functionality within your ERP manufacturing software. In addition to being a great company, you also have to be able to show it. This makes integrated financial reporting the most important feature in a manufacturing ERP system. Being able to track how improvements in production planning, scheduling and workflows translate into reduced costs are a must-have in any manufacturing ERP software. Look for ERP systems with job costing, advanced cost allocations, integration accounts payable, accounts receivable, payroll, bank reconciliation and fixed asset accounting. The best ERP systems for manufacturing companies will support these foundational features while providing financial reporting to capture how improvements on the production floor translate into reduced costs, higher quality and increased revenue. The majority of manufacturing ERP systems today support general ledger (GL), fixed assets, cost- and accrual accounting-based workflows, budgeting and project accounting, often all integrated to a common system of record or database. At a minimum, a manufacturing ERP system needs to support requirements planning, master production schedule (MPS), capacity planning, bill of materials, shop floor control and project management. Taken together, these functional areas of manufacturing ERP software makes it possible to operate a production center efficiently, tracking performance back to financial reporting. Advanced ERP systems have these modules integrated into a common database or system of record. Requirements planning is essential for creating and tracking production and inventory control plans while taking into account material requirements, lead times and dependencies in supply chain visibility and supplier delivery performance. Every manufacturing ERP system will contain a manufacturing execution system (MES). MES manages the daily scheduling on the production floor, taking into account MPS workflows, bill of materials requirements and the skill sets of machine operators. Best-in-class MES can take all these factors into account and drastically reduce the time required to produce a given product. Also, MES supports production and labor tracking, overall equipment effectiveness (OEE), and material optimizations. Manufacturing analytics and reporting tools can then provide insights into how an overall production center is running. In evaluating manufacturing enterprise software, be sure to look for vendors that support demand planning, logistics and transportation management, procurement and sourcing, quality management, supply chain planning and drop shipments. Additional features you’ll need to include warehouse management, distributed order management, enhanced purchase order management, sales and operations planning, and compliance management. Going with a single manufacturing ERP vendor for this and other areas of your IT strategy will provide a single system of record to capture, report and plan using the modules mentioned. Manufacturers can gain a competitive advantage over time by having insights into each of these areas about competitors. Along with the key features needed in a manufacturing software system, there are several other features to consider. The following features are either not integral to a manufacturing system or may need to be provided by a third-party software provider. For many companies, project management tools make managing manufacturing much easier. Some manufacturing software systems provide workflows based on different types of project management principles, such as the agile principle. In addition, manufacturing ERPs may offer Gantt charts to help users quickly visualize and track resource allocation. This is helpful when it comes to task allocation as well as determining production schedules. Asset management is an essential function when it comes to manufacturing. However, it's not directly related to production and can be provided by third-party systems, like a CMMS solution. However your team decides to handle asset management, make sure your system can effectively perform several tasks. First, your system should be able to track fixed assets through their lifecycle. Secondly, a good asset management system should allow users to schedule preventive maintenance to reduce as much downtime as possible. Third, your system should provide a record of all maintenance and related data, such as tax information. Lastly, many advanced asset management tools allow businesses to track the energy output of their assets for compliance assistance. ECommerce functionality is also not directly related to manufacturing but can be extremely useful when it comes time to distribute. This feature provides an online storefront for your customers to use, providing an additional channel, or perhaps the main channel, through which you sell your items. Many systems provide a shopping cart and allow users to customize the interface. However, for more advanced eCommerce tools, businesses should consider a dedicated eCommerce platform. Once you think you understand the features you need from an ERP for manufacturing, it’s a good idea to start comparing vendors. Consider checking out our Manufacturing ERP Leaderboard to get started. Our analyst team has evaluated the best ERP for manufacturing systems by how well they fulfill the most popular requirements. See which leading systems perform better when it comes to features like production management, transportation, accounting and more. But however you end up assessing your list of manufacturing ERP software systems, make sure to perform an in-depth comparison with all the features and vendors that matter to you. To determine which requirements your business will set, you need to ask yourself and your internal stakeholders a series of questions to truly understand what kind of system you need. What’s wrong with how you are managing manufacturing operations today? What manual workarounds are you relying on today to get work done that your manufacturing ERP system needs to automate? Are you relying on Microsoft Excel to handle production planning and scheduling? Is your existing financial reporting system integrated with production and inventory control systems so you can see how manufacturing decisions impact profitability? If you have a manufacturing ERP solution in place, ask yourself why you are looking to make a change. Who uses the current manufacturing ERP software? Which departments are everyday users, and which are only using your manufacturing ERP system occasionally? What are your manufacturing software users trying to achieve by using the solution, and how well can they carry out their goals? Is the system not cost-effective for your current users? Are you paying too much in monthly or annual fees for unused features? Is the manufacturing ERP system too difficult to use today? Is it challenging to learn? Was the manufacturing software designed when your company had a different business model than it does today? What’s the information and insight you need to run your business that your existing manufacturing ERP software doesn’t provide today? Does your existing Manufacturing ERP system support analytics and business intelligence (BI) reporting? What kind of Manufacturing ERP system will you need? What manufacturing workflows aren’t being addressed by your current manufacturing ERP system today? Does your manufacturing software support quality management and compliance reporting company-wide or just in the quality department? How much time does your company spend on generating compliance reporting? What workflows and production processes most differentiate your company and make it unique? Define the five production processes that most need improvement in your business today. How complex are your existing products and are there plans to add more configurable, customizable products in the future? What’s the typical lead time for your company to produce its most common and most complex product? How can this be improved? Is inventory management and control automated or manually-based right now? Is it possible to close the general ledger and financial reporting every month? How will the Manufacturing ERP system perform once deployed? Is your company considering an on-premise or cloud-based manufacturing ERP system? Who will be responsible for keeping the manufacturing ERP software up-to-date and be its administrator? What devices will the manufacturing software need to run on throughout your company? Are you considering having the manufacturing ERP software accessible from the production floor to share bill of materials (BOM) across manufacturing teams? How customizable do you need the individual screens, applications and platforms to be to support your business? Will the manufacturing ERP system be able to manage the wide variety of data reports needed to run your business today? How about in a year from now? Can the manufacturing software generate reports that are easily comprehensible for executives of your organization? How will the manufacturing ERP software integrate with your current technology? How well will it replace the functionalities of any existing ERP systems you have? What support or training will the vendor provide during and after installation? How do I track my daily manufacturing operations and their impact on our financial statements? The most important criteria for evaluating any ERP provider is whether they have previous experience with your industry’s specific requirements and unique needs. Be sure to ask for examples of customers who are live today using their software to solve comparable industry challenges. If at all possible, go and visit customer references and walk the factory floor to see how their specific implementation of a manufacturing ERP system is performing. Additionally, ask to see how the technicians working on the shop floor use the workflows and screens to complete tasks and move products on to the next cell or area of production. Based on all of these activities, a vendor should be able to produce a workflow for you reflecting how their customers are using their systems. All of these workflows should also be auditable and reflect transaction history over time. Can you provide an example of discrete, mixed mode and engineer-to-order (ETO) workflows all within the same manufacturing location? Manufacturers are continually striving to create new products, managing the product configurations and turning them into product lines. At the same time, manufacturers need to support mixed-mode manufacturing strategies, all from the same plant floor. Ask to see workflows that provide for mixed mode and highly customized or ETO production sequences using standard and non-standard inventory items. This will tell you how well the ERP vendors you are speaking with can scale across multiple manufacturing processes and strategies. How quickly can a new product be defined in your ERP system from the bill of materials level through work instructions? For many manufacturers competing in complex, fast-moving markets, they need to quickly create new bills of materials (BOMs) and define workflows to the work instruction level. The greater the compliance in a given industry, like with aerospace and defense, the more important this becomes. Ask to see how this workflow is handled for make-to-stock, mixed mode and highly customized ETO-based products. In addition, it will also help to see how well the BOM functions are integrated across the entire production floor. While many ERP vendors are capable of doing this, it’s interesting to see how easy or difficult the overall process is. How can the manufacturing teams make use of the ERP system? There are many uses of ERP information across the manufacturing floor of a business. Look to see if the ERP providers you are evaluating mention bill of materials (BOM) management, quality ratings by suppliers, inventory position by part, production scheduling, manufacturing execution system (MES) support and backlog management. What information will my sales team have access to? In most manufacturing systems, sales can easily run reports to find out which customers’ orders have shipped, which are in backlog and which are in production. Having this information at their fingertips give them the ability to serve customers more effectively, while upselling new products and services. In advanced manufacturing ERP systems, sales management can see what pricing programs are working the best and also collaborate with marketing on new selling strategies, immediately seeing what’s working or not. Will it grow with my business? If you’re investing in an ERP solution, you don’t want it to be obsolete in a year. Plan to implement software that will last at minimum five to 10 years. ERP should also be scalable if you plan on significant growth in the next decade or so. Find out what the limitations are on the scale and reporting capability of your system so you can make an adequate decision about whether the software is right for you. The best manufacturing software can take your business to the next level, allowing you to compete in an unforgiving supply chain. Manufacturing ERP software helps businesses save time and money but only if you spend enough time during your software selection. It’s important that, in addition to this guide, you seek out all the materials needed to find the perfect software system for your business. Take control of your inventory and your warehouse with simple user customization features that allow you to turn manual processes into management by exception. Before you throw "labor" at your challenges, let Infoplus show you how the right technology can save you time and money. Get unparalleled support from industry experts to show you best practices around anything from SKU management, to pick - pack - ship operations. aACE is a comprehensive tool that seamlessly supports the sales, operations, and accounting needs of SMEs. As the letters in our name suggest, aACE unifies Accounting, Customer relationship management, and Enterprise resource planning into an integrated package. aACE 5 is artisan software which our clients describe as a delight to deploy and a pleasure to use. Flexible, affordable, and elegant, this latest version of aACE realizes the team’s vision of Art in ERP. In addition to accounting, CRM, and ERP, core aACE functionality includes inventory, order management, production, shipping receiving, and scheduling. aACE accommodates most client needs right out of the box. And because it’s built on the FileMaker platform, aACE can be customized easily, efficiently, and cost effectively. aACE solves the inefficiencies and lost opportunities that arise from a software suite not fitted carefully to a small or mid-sized business’ unique needs. It offers a compelling alternative for business owners who feel dissatisfied with browser-based solutions like NetSuite, open-source solutions like xTuple, or client/server solutions like QuickBooks, Dynamics, and Sage. When clients transition to aACE, they report greater visibility, accuracy, and velocity. These benefits translate into improved employee morale, increased customer satisfaction, and a healthier bottom line. MIE Trak Pro ERP is meant for manufacturers by providing modules designed to accommodate most production cycles and optimizes the capabilities of repetitive, custom, quick-turn and mixed mode operations. MIE Trak Pro streamlines the following features for maximum speed, efficiency, accuracy and control all in real time: Accounting, Business Analytics, CRM, EDI, BOMs, Barcoding, Human Resources, Inventory Control, Invoicing, Quality Control and Inspection, Repair and Maintenance, RFQ/Quoting, Sales and Purchase Order Processing, Time Clock and Work Order Scheduling and Reporting. Realtrac Performance ERP is a software company specializing in manufacturing software for machine shops, job shops, and make-to-order manufacturers. The company was founded in the heart of a machine shop and has served the manufacturing industry for over three decades. The program is used by thousands of businesses across North America.Realtrac’s ERP software is very easy to learn and use and boasts the lowest total cost of use software on the market. With a quickstart implementation, Realtrac ERP is operable in just a few days compared to weeks or months. Realtrac is built on a real-time platform allowing businesses to stay on top of job, labor, vendor, and customer tracking. From Estimating to Quality Conformance to Accounting Integration, Realtrac is a completely integrated shop system that is real quick with real profits. Realtrac gives an analysis of a business’s current and past status allowing them to make educated decisions for a maximum return on investment. SYSPRO ERP simplifies business complexity for manufacturers and distributors. It can be deployed in the cloud, on premise, or through a hybrid model, and is accessible from any device, at anytime, anywhere. The fully integrated business solution includes accounting, inventory management, order management, planning and scheduling, supply chain management, warehouse management, production management, customer relationship management (CRM), business intelligence, and manufacturing operations management applications. Enterprise Business Systems software that is easy to work with. ForeMost works the way your business works today. A complete suite of applications that easily integrates with accounting, payroll, reporting, business intelligence software, .NET, Web Services, and SQL Systems. You must see ForeMost if you are considering upgrading your business systems software! Our Foremost ERP Fund Based Accounting Solution facilitates Integrated, Grant Based, Cost Accounting! For over 30 years, Chempax has been helping Chemical Process Manufacturers and Chemical Distributors cut costs, improve operational efficiency and make better decisions faster. Combining the latest technological innovations with our chemical industry expertise, Chempax address you unique requirements of your industry and offers total integration for the daily demands of your business with powerful functionality options. Chempax is the ready to use solution that is seamlessly integrated allowing you to see rapid ROI without missing a beat. Single, simple solution for job shops, contract and a variety of make-to-order manufacturers. Comprehensive ERP that includes everything from estimating and quoting to scheduling, purchasing, shipping, customer management (CRM) and accounting.Using Quickbooks currently for Accounting? No problem. E2 Shop System is Gold Certified through Intuit and we offer a superb integration so you don’t have to change your accounting system. Shoptech Software offers exceptional implementation assistance so you’re up and running quickly.  The Support Team has received top notch reviews from Customers. 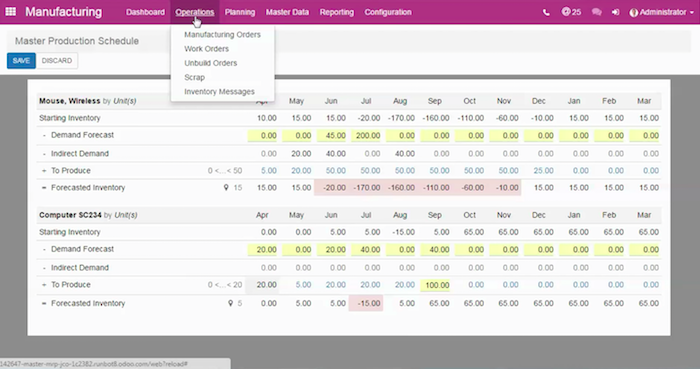 Odoo ERP, formerly OpenERP, is the #1 open-source ERP platform and integrated business app suite in the world. With Accounting, Manufacturing, Service, Inventory, Marketing, Retail, eCommerce and many more apps Odoo is winning over more traditional ‘big name’ competitors. As a trusted partner of Odoo, Vayam delivers top-notch consulting, service and support for your critical business projects.Inventory Supply Chain:Manage your supply chain, vendors, purchasing inventory in one easy, customizable app:Forecasting automated fulfillment.Vendor/Supplier Management.Purchase order processing.Goods receipt and warehouse management.Inventory management.Barcode, RFID, labeling support.Seamless integration with Accounting, Sales, Manufacturing, Maintenance more!Manufacturing Maintenance:Manufacturing and/or maintenance applications that support and improve your business processes:Monitor workflow status.Make better decisions through insightful analytics.Reduce costs by eliminating inefficient processes.Provide maintenance manufacturing instructions, documents videos.Integrate Sales CRM, e-Commerce Retail, Vendors, Inventory more!Retail e-Commerce: Need more than the basic e-Commerce website? We create modern, full-featured e-Commerce and Retail websites and back-end systems:Full customized, mobile friendly e-Commerce sites.User friendly Point-of-Sale (POS) for brick-and-mortar.Barcode, RFID, labeling support.Integration with Amazon, Ebay Magento.Built-in Search Engine Optimization (SEO).Custom reports and analytics.Shipping integration for UPS, USPS, Fedex, DHL.Seamless integration with Products, Inventory, Customers, Order tracking more!Sales Customer Relationship Management (CRM):Manage and monitor your most vital relationships with potential and existing customers insuring follow-through and improved communication:Manage contact Information, action items, important notes, and client meetings.Improve leads, opportunities, qualifications and management of contacts.Help control prospect-to-win pipeline.Monitor sales performance against targets and goals.Dashboards and reporting to easily manage your teams and make better decisions.Establish better process flows and guidance for client facing teams.Increase ability for add-on sales.Manage marketing campaigns, newsletters, surveys, and online forms.Employees Human Resources:With Odoo HR, Recruiters and Management can manage employees like never before. Odoo helps recruit, onboard, train, engage monitor employees by providing:A communication portal for your whole team – organize discussions around products, services and more.Automated messages to keep employees informed and help manage vital processes for your business.Full-featured Recruiting app: easily post jobs, manage candidates, resumes and interviews.Quick access to vital Employee data: contact info, job titles, vacation schedule, meetings.Tools to manage timesheets, vacations, holidays, and expenses.Easy to build Employee Evaluation/Appraisal forms.Employee Engagement Customer Feedback Surveys with automated result reports.Easy to create manage new hire onboarding and ongoing employee training material.Automated and customizable reports and analytics. ProcessPro offers the market leading batch process ERP solution. ProcessPro Global is built on the world’s most accepted technology, spanning the broadest set of functional capability and providing the ability to customize without the penalties commonly experienced with other software vendors. ProcessPro offers a robust ERP system with full manufacturing, inventory and financial integration - a complete system from beginning sales order entry through the manufacturing and accounting process. The software solves the critical needs of batch processing, including forward and backward lot traceability and the management of complex formulas and recipes. The fully integrated quality control functions eliminate the need to re-enter data, and the centralized database provides immediate and accurate visibility of sales, manufacturing and inventory across your business. BatchMaster ERP is an end to end, tier one ERP solution that is built upon the SAP Business One platform and designed to meet the unique needs of formula-based, process manufacturers. Key process functionality supported includes R D Lab, Samples, Formulation, Production, Quality, Compliance, Costing, Planning and Scheduling plus Mobile Warehousing. Accounting, sales, purchasing, maintenance, inventory, customer service and other front office processes have all been enhanced to better support the needs of process manufacturers. Our comprehensive industry specific solutions for food, chemical, nutraceutical, and pharmaceutical manufacturers enable our customers to streamline their operations, reduce overall costs and ensure quality and compliance. BatchMaster ERP can be deployed as an on-premise or in the cloud solution. The IQMS Manufacturing ERP system is a comprehensive, end-to-end solution that provides complete integration and visibility of the order to cash process. The extensive feature set allows manufacturing companies to react instantly to events happening throughout their organization, from the front office to engineering to the shop floor and supply chain. IQMS provides the visibility, planning and execution tools that enable manufactures to excel. VAI's technology roadmap, our shared vision with IBM, provides companies with a business model based on best industry processes that leverages technology to create value and improve performance. The S2K family of products includes solutions for Distribution, Manufacturing, Retail, Service, and Rental companies; with industry specific features for Durable Goods, Apparel, and Pharmaceutical. Thrive in a world of mass customization with Infor LN. More than 4,500 manufacturers trust LN to help improve, accelerate, and streamline the most complex manufacturing processes anywhere. When your manufacturing operation requires detailed tracking of millions of parts from thousands of sources worldwide from as-designed to as-maintained, you can rely on Infor LN. Cloudsuite Industrial SyteLine is a single system of business process modules covering: Customer Relationship Management, Sales Order Management, Product and Process Engineering, Resource Planning, Supply Chain Planning and execution, multi-mode manufacturing execution, Quality Management, Aftermarket Service Management, Financial Management, Enterprise Performance Management, Reporting and Analysis, Human Capital Management, Technology Web/ Dot Net / SQL (Embedded Development Framework), MS Office Solutions Integration. Epicor Enterprise Resource Planning (ERP) software includes solutions for customer relationship management (CRM), manufacturing operations, supply chain management (SCM), human capital management (HCM) and more. Highly flexible and scalable, Epicor ERP systems can be deployed to fit your unique operational needs, resources, and budget, including on-site installation, hosted, or as a SaaS or Cloud application. You simply determine the deployment model that is right for your organization. Infor CloudSuite Industrial (Syteline) helps manufacturers and distributors of all types improve productivity and respond faster to change. From selling and sourcing to production and fulfillment, this robust enterprise resource planning (ERP) solution provides organization-wide visibility. Organizations of all shapes and sizes from small to those larger companies with highly complex supply chains are able to cut costs and ensure on-time production and delivery by using Infor CloudSuite Industrial to automate and manage key business processes, implement highly efficient process flows, and better match supply with demand. Infor M3 offers ultimate flexibility in operations, technology, and scale. As a multi-site, multi-country, and multi-company solution, M3 empowers your organization to adapt to changing business needs. It provides flexibility in managing mixed-mode and complex environments, with the agility to make quick adjustments at any time. Written in Java, M3 also gives you platform independence and choice. Manage your ENTIRE business on a single cloud ERP designed for the smaller SMB (Small to Mid sized Business). Inventory, Orders, CRM with sales Commissions, Accounting, and E-commerce (add on @ $99 per site per month). Kenandy's ERP empowers business innovation. Built on the Salesforce App Cloud, Kenandy has redefined enterprise resource planning by allowing companies to map their business processes and implement applications remarkably fast. With the automation of operational systems including global financials, procure-to-pay, planning and production, quote-to-cash and trade promotion management, Kenandy customers have the freedom to focus on driving innovation and growth. For more information, visit: www.kenandy.com. abas ERP provides a fully integrated ERP solution ideally suited to mid-size manufacturing and distribution companies that increases productivity, reduces costs and grows opportunities. Key modules of the software include: Sales Management CRMAdvanced Planning and Scheduling / APSPurchasingProduction Planning and Control (PPC)Materials ManagementService ProcessingFinancials and AccountingBusiness Intelligence and AnalyticsDocument Management Mobile ProcessesEDI and High-Performance LogisticsProcess Control and Workflow ManagementMulti-Company AccountingMulti-SiteProject ManagementIn addition to a robust standard feature set, abas ERP makes it simple across the board to adapt your system to your own business processes. And the best part? With abas, when you customize your system, you can still upgrade hassle free. abas ERP’s multi-tiered architecture, which separates your customizations from the business and database layers of the system, allows for smooth upgrades from older versions of the software. The independent components eliminate the need for rewriting previously developed custom programs, screens, and reports. Complete: One cloud for your entire business. Oracle ERP Cloud is a complete, integrated and modern cloud application suite that manages accounting, procurement and projects enterprisewide. Equip your workforce with a modern ERP and empower them toward higher levels of productivity. Like a computer or a phone that has an operating system to support its applications, a business needs its own system to tie together its customer, product, accounting and personnel information. This is what CBOS provides: an all-in-one business solution that is available anytime, anywhere. CBOS offers a hosted, cloud-based, mobile, Software-as-a-Service (SaaS) solution with user-defined roles, multiple levels of security for data storage and user access. The CBOS platform provides information that can be accessed by all departments and eliminates individual solutions for each department and the repetitive, error-prone input of data. Offered economically on a monthly billed basis, the CBOS platform provides your company with a single solution to help you grow, and puts you in the driver’s seat to manage your organization, customer data, product or service offerings and personnel information. SAP Business One is designed to meet the needs of SMEs and subsidiaries of large enterprises. Businesses that adopt SAP Business One, very quickly see measurable benefits of using an integrated ERP application. Compete with the Biggest in Business - You’re competing with the biggest brands—but you don’t have their economies of scale. Modern best practices are built into Oracle’s cloud applications for finance, putting you on a level playing field with enterprise competitors. Leverage the built-in best practices of Oracle ERP Cloud to standardize operations, add digital capabilities, and support future growth. Oracle's modern, integrated cloud applications deliver the functionality, analytics, security, and collaboration tools you need to run your business. Expandable ERP supplies a complete business foundation for manufacturers with expanding business operations. The system helps establish auditable, regulatory-compliant business processes so companies are prepared to make the transition from emerging company to profitable, high-volume manufacturer. The Expandable system unifies the company around a single database where all transactions are recorded using sound business rules and logic. The entire company can work as one in real time to produce high quality products on time at expected margins. What makes Expandable unique is the ability to implement its fully integrated ERP system early in a company’s growth cycle, providing customers the means to grow all the way to the billion dollar mark without changing systems. To assure customer success, Expandable employs the direct support model where all implementations are performed entirely by direct employees of Expandable Software, Inc. The direct model produces successful implementations performed by knowledgeable people who have experience helping growing companies install the integrated business processes necessary for long-term success. As a comprehensive ERP platform with the industry’s largest functional foundation, Deacom provides manufacturers and distributors with a rich set of functionalities and extensibility designed for their growing businesses. All capabilities specific to their industry are built by Deacom into the core system including: warehouse management, formulation, inventory management, CRM, point-of-sale, direct-store-delivery, lot traceability, forecasting, and ecommerce, to name a few. Deacom’s ERP solution built upon a .NET framework, delivers a flexibility unmatched by Tier 1 ERP providers as it can quickly adapt to growing industry and regulatory developments. Understanding that an ERP implementation is a significant investment, Deacom provides a guaranteed fixed-price implementation - an offering that leading analyst firm, TEC, deems as “virtually unheard of in the ERP software marketplace.” The company’s strong team of ERP and process manufacturing experts drive its implementation success rate of 99% which drastically exceeds the industry standard. By specifically focusing on the manufacturing and distribution industries, Deacom delivers the critical business functionality needed to drive operational success. Under its Kaizen philosophy, Deacom is constantly working to identify, develop, and deploy the latest functionality to drive efficiencies for its customers. SAP Business One is an enterprise resource planning (ERP) solution for small and mid-sized discrete and process manufacturing companies. This all-in-one manufacturing solution provides the accurate, real-time information that growing manufacturing companies need to effectively run their day-to-day operations. Enterprise Resource Planning (ERP) software by Oneir Solutions Inc make mid size and growing businesses more competitive. In particular, businesses that operate with remote locations and have sales reps on-the-road…no matter where they are or how many.